When I found out the winner of our first contest was pregnant, I couldn’t resist making her some of my favorite homemade belly butter in addition to her prize of a wedge of homemade Humbolt Fog-inspired cheese. 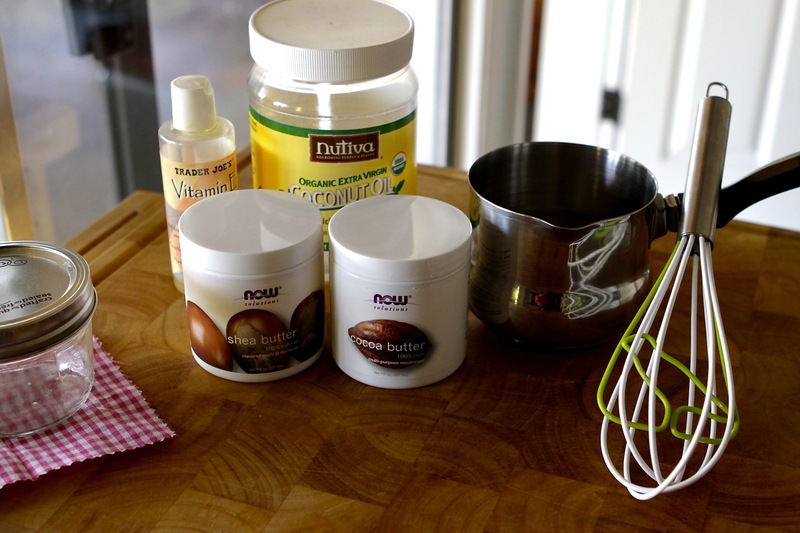 I made up this recipe for stretch mark preventing belly butter when I was pregnant. I used it daily and credit it for sailing through pregnancy without a single stretch mark. Like my Iced Red Raspberry Leaf Tea Recipe (another natural pregnancy remedy) I have been wanting to share it for some time and figured this was a great excuse for sharing it without fear of triggering pregnancy rumors in my extended family. Researching stretch marks, I learned that the biggest risk factor is genetics. Since my mother did not escape her pregnancies unmarked, I was extra motivated to try to prevent them. The second biggest factor is simply dry skin. This formula uses all natural ingredients, many of them food grade, to nourish, feed and hydrate the skin. I believe this allowed my skin to expand as needed and bounce back better afterwards. I am sensitive to artificial perfumes, and was all the more so during pregnancy, and I had an aversion to the smell of all the stretch mark creams that were commercially made. Like all mothers, I wanted my growing babe to have the best start, so turning to natural ingredients, instead of rubbing chemicals into my bump, was a no-brainer. You could easily add a drop or two of essential oils to add a scent, but I preferred the butter as is, smelling like chocolate and coconut–yum. Place all the ingredients in a small saucepan on very low heat. Heat just until melted. Whisk and remove from heat. Pour into a jar or covered bowl. Chill in the refrigerator until solid. If you do not have one of the ingredients, other options to substitute in include Olive Oil or Argan Oil. You may notice that your finished product is more solid or less solid depending on the products you use and the brands you use. One tip is to keep in mind the relative hardness of the oils/butters. Here’s what I have found, listed from firmest to runniest: Cocoa Butter, Shea Butter, Coconut Oil, Vitamin E, Avocado Oil. Don’t ever add water to your mix to make it runnier as this can speed up molding, but add a little more Avocado Oil or Olive Oil if you would like it softer. Conversely, if you want it harder, use a little more Cocoa or Shea Butter. Feel free to experiment! Coconut Oil has fatty chain acids that work to regenerate and rebuild the connective tissues that cause stretch marks. Massaged daily into the skin, it can help keep the skin on a growing belly supple and flexible. Purchase unrefined coconut oil as it has more of the healthful properties (it also smells more “coconuty”). Cocoa Butter contains natural antioxidants and is one of the most stable fats. Although a recent double blind study did not find it better than placebo in preventing stretch marks, it was found to be moisturizing and soothing and daily use prevents dry, itchy skin. Depending on the brand, it can smell quite like chocolate. Shea Butter originates in Africa and has been used for ages for all kinds of skin care concerns, including dermatitis, eczema, psoriasis, burns and stretch marks. Shea butter enhances the skin’s natural barrier function, increases the moisture levels, and helps with cell regeneration. It also helps with capillary circulation, helps sooth irritated skin, helps protect against UV rays and helps with restructuring effects on the epidermis. Try to purchase it unrefined. Avocado Oil is my new favorite cooking oil. It can be used up to 500° F, as opposed to olive oil, which really shouldn’t be heated above 325° F, or it scorches and coverts to trans fats. Avocado has a mild, neutral taste, making it a great replacement for vegetable oil. Used topically on the body, avocado oil is wonderful for moisturizing and is rich in vitamins, fatty acids and antioxidants, including vitamin E.
Vitamin E is a very powerful antioxidant that prevents the formation of free-radical particles. Free radicals break down skin cells and create aging and depletion of nutrients. Vitamin E is known as a natural scar remedy when massaged into the skin. It stimulates the collagen in the skin, which can provide a noticeable difference when it comes to texture and strength. The antioxidant also promotes cell growth and is also a natural anti-inflammatory. Although not a preservative, vitamin E, as an antioxidant, can also help prolong the shelf-life of the belly butter. When you purchase a qualifying item from Amazon through a link or ad on our page we receive a small percentage. Your price is never increased, in fact, you automatically get the lowest price available at the time. If you like the Baby Birds Farm and Cocina blog, then purchasing through our “Store” page or through a link is a great way to support us! We have strict control over which products we feature, typically use them ourselves and hope you will enjoy them. We are also happy to add items upon request. Thank you!